The Rural Doctors Association of Australia (RDAA) says it will be forced to collect the proposed $7 co-payment on behalf of the government. This non-medical duty for doctors will also include fulfilling red-tape requirements associated with it, and being called back to their local hospital to treat more patients, who will not be able to afford earlier visits. RDAA is also concerned rural doctors and patients will be victims of crossfire between the federal and state governments, as they fight to pin-down health funding. “At a time when the federal government is talking about the need to ensure doctors are spending their time treating patients and not filling out endless paperwork, [the] Medicare co-payment announcement is irony in capital letters and underlined,” RDAA president Ian Kamerman says. 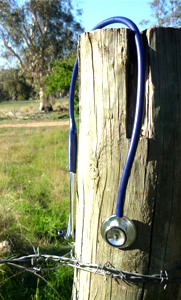 “Rural doctors and their practice staff will now be forced to negotiate the Medicare co-payment with nearly all the patients they see, including those in nursing homes and from disadvantaged backgrounds, causing yet more stress on doctors and staff, more time lost due to government red-tape while waiting times get longer, and quite possibly more financial stress as doctors opt to lose money rather than charge the co-payment to needy patients. “There is a real danger that the introduction of co-payments will discourage more doctors from staying in rural practice, and place a further bureaucratic load on those doctors remaining in the bush,” he said.